Retina | Fovea | Optic nerves and the blind spot | So what? The rear system is like the sensor in a camera, as it accepts light from the front system and turns it into nerve signals that can be sent to the brain. The retina is the region in which light detection cells are found. It includes rods and cones, the sensor cells where light is converted into signals for the brain. It also includes the optic disk, where nerves gather to feed back to the brain. In the middle are cones, which give color vision. Outside this, rods are only black and white, even though we think we can see everything in color. This illusion is a product of our clever brains. Rods are smaller than cones and hence give us higher resolution vision than cones (which may be why monochrome photographs seem so impactful). They are more sensitive to light than cones, which is why night vision is more monochrome. The fovea is the inner part of the retina and is situated in the macula (a small, round, darker area at the back of the eye). It is the central focus area where we pay attention. Unsurprisingly, it is designed to gather higher resolution detail. The rest of the retina is only really for filling in detail and giving us peripheral vision. It contains cones that detect color, unlike rods in the rest of the retina. There are three types of cone: L, M and S, which stand for the Long, Medium and Short wavelength of the light they detect. L, M and S approximate to Red, Green and Blue. Cones are less sensitive to light than rods, but they are more sensitive to changes in light and adjust first when you move indoors (making your sight seem rather funny). Cones also are better at helping spatial acuity. Outside the fovea is the parafovea belt and the perifovea outer region. Across these, cones become increasingly sparse. In the middle of the fovea is the foveola, where cones are slimmer, longer and particularly tightly packed and which give us higher resolution vision at the middle of our field of vision. This is wherever we look and which fools us into thinking our whole field of vision is high resolution. The middle of the foveola is called the umbo. The sensitivity of S, M and H (blue, green and red) cones are different, with blue cones being most sensitive (which helps explain why things at night seem blue-tinged). 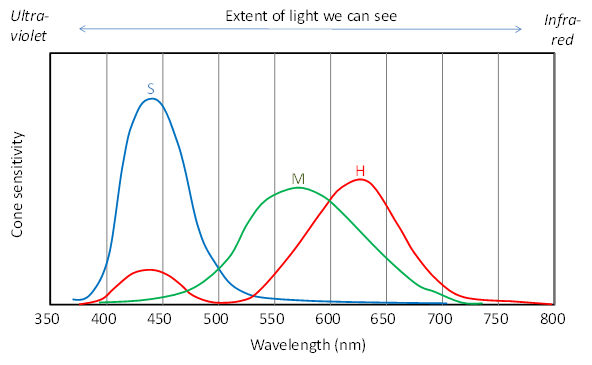 They also cover very different distributions across the light spectrum. The optic disk is where all the nerves from the rods and cones gather to form a single 'cable' that goes back into the brain for visual processing. It is situated to the side of the middle of the retina, away from the fovea where our visual focus is. This is where the 'blind spot' is, as there are no rods or cones here. The brain helpfully fools us into thinking we can see in this area (otherwise we'd have a black spot in the middle of our vision. Visual perception starts with the eye, which has many limitations. The brain fills in much detail and gives us much of what we 'see'. When we move our heads, the eye's signals are turned off briefly, even though we do not realize this. The sheer quantity of detail means we do not remember as much as we think we remember (try describing a friend's face in detail!). This is important in such as witness statements or where people say they saw something which they may not have really seen. The limitations of the eye are taken advantage of by magicians and others who want you to not see things.